← HOT Water – New Tankless Water Heater!!! So I went a little crazy … It started with the strawberries, they are doing so well. Then I have this large empty pot I wanted to put a dwarf tree in. At the nursery, I really had a hard time picking what type of tree I wanted. I ended up with a Satsuma Mandarin, which I love, but still was aching for the Meyer Lemon, with its versatility. Then, at the hardware store, it ends up dwarf trees are on sale, so in my indecisive manner I decided to go for the Meyer Lemon, Grapefruit then threw in an Avocado for good measure. 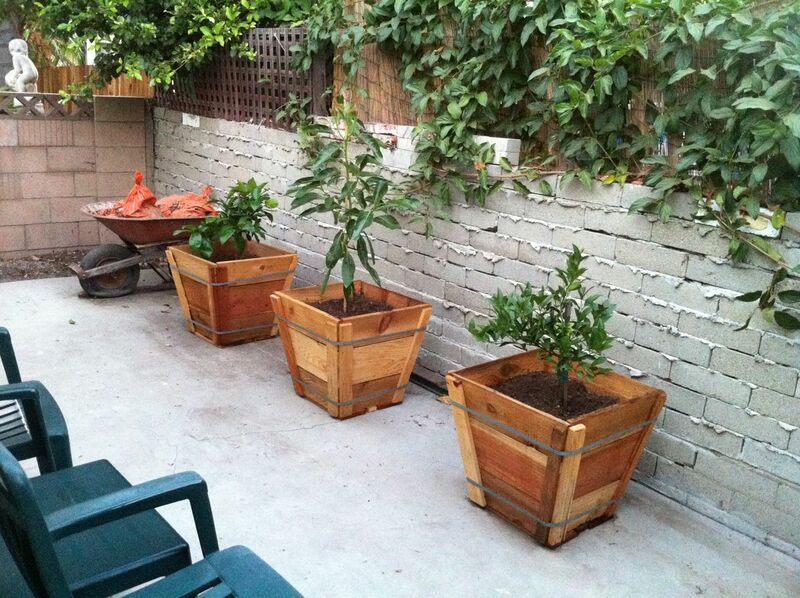 Toss in a couple inexpensive wood planters and my former trash can – junk area is now an orchard! where can i buy these wooden planters?